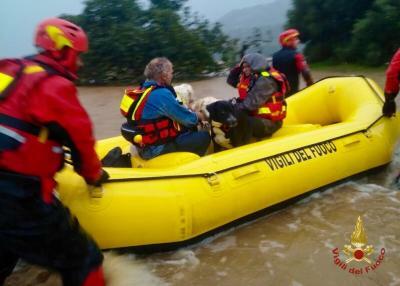 CAGLIARI – Sardinia is on red alert as torrential rain continued to sweep across the island’s south overnight causing widespread flooding, police officials said on Thursday. Roads remain impassable and schools have been closed. Firefighters have already carried out 120 interventions in the Cagliari area, rescuing people trapped in houses and stranded on roofs. There are fears for two people reported missing. In Assemini in the province of Cagliari, a 45-year-old woman went missing after she and her family fled their country home fearing the nearby river would overflow. Unsure how to navigate through the deluge, her husband stepped out of their car in the Sa Traia area. Floodwaters inundated the vehicle sweeping it into a stream. Police rescued the man and his three daughters but there was no sign of the woman. Part of the state road that connects Cagliari to Capoterra collapsed yesterday, splitting the highway in two.